Jazz Jennings is sharing her real-life experiences in her very personal story about having a girl's brain in a boy's body. You may have seen Jazz on the Oprah Winfrey Network, 20/20 Specials with Barbara Walters and the Rosie O’Donnell Show. My family first saw Jazz and her family on a 20/20 Special about six years ago. Believe it or not, that show was my first introduction to what transgender was all about. As we watched, I saw so much courage and strength and love in that family, that I knew what I had to do within my own family. It was after that show Ron and I decided we would let our child transition into the young man he is today. Jordan finally met Jazz at Camp Aranu’tiq and he thinks of her as a “Pretty awesome girl.” I can only imagine how awesome this family truly is. I look forward to the day when I finally meet Jeanette and her family. 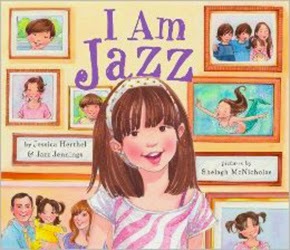 In the meantime, I’m going to buy a few copies of Jazz’s book and give them to some people I know who need to learn more about our transgender children. The book is written for children so here’s hoping some of my adult friends will understand. Buy the book (and read the reviews) here. Visit Jeanette’s non-profit here (that’s Jazz’s mom). See Jazz as a youngster. The Barbara Walter’s interview of Jazz as a tween.